UCAL’s CMD, Jayakar Krishnamurthy shared the business plans and the company’s focus on R & D for developing new products. Emboldened by an upswing in its financial performance, Ucal Fuel Systems Ltd is looking for partners to set up joint ventures for power train products. 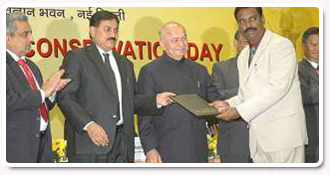 UCAL Plant I was awarded National Energy Conservation Award at New Delhi on 14th December 2009 by Hon'ble Union Minister for Power, Shri. Sushil Kumar Shinde. 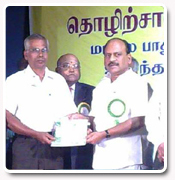 Mr. Sivakumar, Head of Maintenance, UCAL received the award on behalf of the company. 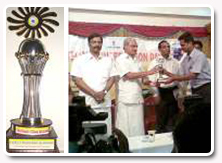 Also, Plant II received the Energy conservation award for the year 2009 from the Government of Puducherry on 15th December 2009. The Bureau of Energy efficiency, New Delhi and Renewable Energy Agency, Puducherry presented it on the Energy conservation day that was observed in puducherry. The award was received by Mr. Swarnam J Vasudevan, Plant Manager along with Mr. Sridhar, Head of Maintenance from the Chief Minister of Pondicherry Mr.Vaithiyalingam. 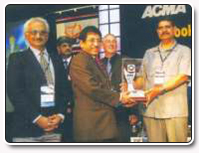 UCAL Plant II located in Puducherry received the ACMA Silver Trophy for Excellence in Quality & Productivity for the year 2008-09 in a function held by ACMA in Delhi on 3 rd Sept 2009. Our Executive Director Mr.P.P.R.Rao (center) & Head Operation- Mr.T.K.Sivasubramaniam (extreme left) received the award. Certificate of Appreciation for Deployment of Poka-yoke. Certificate of Appreciation for Implementation of My Machine Campaign. Certificate of Appreciation for Mr.B.Vijayakumar, the Best Coordinator. 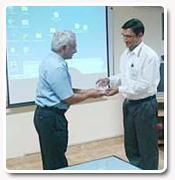 UCAL Plant 6 received Best Vendor award for the year 2008 from one of its esteemed customers i.e. Sona Koyo Steering Systems Ltd. Mr T. K. Mr.T.K.Sivasubramaniam (left) received the award on company's behalf. In the Quality Month celebration observed by Maruti in November 2008 that was extended to suppliers and partners, UFSL Plant III, Gurgaon and Plant I, Maraimalai Nagar took part in the online Awareness Quiz and won the top two positions in the list of 383 Maruti Vendors. 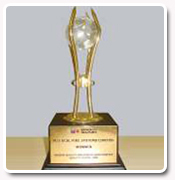 UFSL received the first spot in the Maruti Vendor Quality Awareness Quiz Award in November 2008. One of our operators Mr. M ChandraSekaran from Maintenance in Plant I recevied Tamil Nadu Government's Best Employee Award (III Place) for the year 2006 for his suggestion to save energy bill to the tune of Rs. 8, 00,000/- per year. Of the 5 best kaizens submitted to the Inspectorate authority for 2006 state level competition, Mr. ChandraSekaran's kaizen won laurels to UFSL. The Minister of Labour awarded him the "The Best Employee award on 5th March, 2010"